Downeast or to the Canadian border, the lobster is king and so are the people who catch them. Boston – January 10, 2013 — Maine Lobster landings for 2012 saw a record 123 million pounds of lobsters caught, an astonishing figure that is more than 450% higher than just 20 years ago and further evidence of unparalleled growth for the industry. The value of the catch has gone from $72 million in 1992 to more than $331 million in 2012. According to experts, no other fisheries segment has seen such growth during the last two decades. These figures suggest two conclusions: One, that the appetite among seafood lovers for Maine lobster has grown quickly, and two; that sustainable fishing practices have worked to keep the industry healthy. The challenge facing the industry is that the 2012 average lobster boat price – the price paid to fishermen for lobster at the dock — is the same as it was 20 years ago. Meanwhile the price of diesel fuel has tripled along with big increases in the cost of bait and boat repairs, creating financial stress for boat owners. In 2012 there were 4,345 active commercial lobster harvesters. Jon Carter, a Bar Harbor fisherman, told the Bangor Daily News that the volume of his catch went up last year but he still had a hard time covering his expenses. For example, bait cost about $25 per bushel in the Mount Desert Island area this past fishing season. Carter said that price is “probably 10 times higher” than the per-bushel price he paid in 1994. The record 2012 catch began early following a mild winter and warm spring. Experts believe the unusually warm ocean waters produced early gluts of lobster that dealers and processors were unable to absorb. The early catch was weighted towards shedders, or soft shell lobster. The price for soft shell lobster plummeted while the price for hard shell lobster did not. Only hard shell lobster can be shipped long distances as the new shell lobsters are too delicate to survive out of water for more than a few hours. Local prices for soft shell lobster dropped while at some point, the demand for hard shell lobster drove hard shell prices up. Last year’s harvest, while record setting in volume, has the experts worried. As of January 3, 2013, reports to the Maine Department of Marine Resources indicate more than 123 million pounds of lobsters have been caught in 2012, an increase of approximately 18 million pounds over 2011. “This unprecedented preliminary landings report provides us with both an opportunity and a challenge,” said Commissioner Patrick Keliher. “We need to look closely at this abundant resource and address the challenges presented when supply exceeds demand, as it did this past year, resulting in a decreased overall value which affects the entire industry. To put this into perspective, in 2005, the industry landed 70 million pounds for $320 million. While the lobster fishery has experienced unparalleled growth in landings, the total value is almost $331 million, a decrease of $3.7 million compared to 2011. The 2011 lobster landings of 104,887,598 pounds with a value of $334,690,345 were at the time the highest lobster landings and value ever recorded since DMR and National Marine Fisheries Service began keeping records. At that time, the pounds and value increased from 2010 levels by more than 8.6 million pounds and $15.7 million. For reference, 2010 landings were 96,208,807 pounds with a value of $318,891,777. In January 2008, DMR began collecting detailed trip level records from dealers. According to the information reported to date, there were 4,345 active commercial lobster harvesters out of the 5,961 commercial license holders in 2011. The weeks before Memorial Day mark the traditional start of the lobster fishing season in Maine and Massachusetts as thousands of boats all along the lobster coast begin heading out to sea each day to lay their traps and begin the harvest. While the fishermen are happy to get going again, those already hauling traps have been surprised, according to reports. They are catching an unusual amount of early “shedders,” or new shell lobster. Although some Maine Fishermen operate year round, the lobster themselves become more active in the spring making them easier to catch. Summer and fall are the prime months of the harvest, but all the fishermen start to get to work this time of year. The experienced boat owners know the lobster traps will not be nearly as full in April and May as they will be in the summer when the water is warmer. For example, in April 2010 the state of Maine reported 2 million pounds of lobster were caught. In August 2010, more than 20 million pounds were harvested. But new shell lobster are dominating the catch now in Southern Maine. According to reports, the number of “shedders” or soft-shell lobster being caught in Southern Maine is way above normal. Normally the soft-shell lobster doesn’t show up until mid-June or July. This month the reports show that 60 percent of the southern Maine catch is composed of soft-shell lobster, which is unheard of for this time of year. Some experts think this year’s unusually warm winter and warm spring may have had an unusual effect on the lobster, causing the shedding season to start early. Soft-shell lobsters have less meat per pound and don’t ship well because of their delicate exteriors. Lobster men get a lower boat price from wholesalers, who in turn charge stores, restaurants and consumers less for soft-shelled lobsters than for ones with sturdy hard shells. Opinions vary on which taste better. Soft-shell lobster meat is not good for some recipes and is too stringy to be cooked on the grill. Carl Wilson, a marine research scientist and lead lobster biologist with the state Department of Marine Resources, told the Maine Forecaster the early arrival of shedders could just be an early kick-off to the season. But, it could also signify a change in the normal lobster harvest schedule. During July and August shedders usually account for 80% of the Maine harvest, reports show. This is because lobster fishermen follow the lobsters as they move from shallow water to deep water. 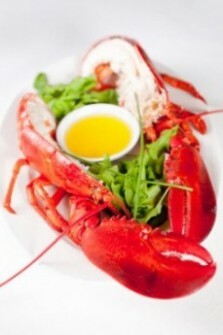 Soft-shell lobster is plentiful during those months and they are easy to catch because they are ravenous. The lobster must eat constantly to grow into their new, larger shells. No one knows what to expect or how this spring’s early shedding of shells will effect the overall lobster season. But for the fishermen out on the water early this season the shedders are coming early making the daily catch much bigger than normal for this time of year. So for now, the Maine lobster fishing season appears to be off to a good start. There is good news for Rocky the lobster. The 27-pound lobster was released back into the wild off Boothbay Harbor, Maine on February 27, 2012, just a few days after being captured in a shrimp fishermen’s net. The aquarium folks thought the crusher claw was probably big enough to really pack a punch so they named the lobster “Rocky.” According to Elaine Jones, education director for the state’s Department of Marine Resources, Rocky could break a person’s arm. Maine fishermen aren’t allowed to keep lobsters that are more than five inches from eye stalk to tail. But even so, Rocky was never in any danger of becoming the guest of honor in a lobster pot – how would you even cook something so large? Instead Rocky became an instant celebrity. After posing for news photos and the television cameras, it was decided that Rocky should be retuned to the wild. Even the aquarium was not set up to meet the needs of such a large lobster. And so he was released. Everyone expects he will make his way right back out to the deep ocean waters where he will continue to breed. Rocky was not the largest lobster ever caught. There is a 1977 record of a 44.5 pound lobster caught in Nova Scotia. Still the 27 pound beast was impressive. Aquarium officials said that large lobsters like Rocky are considered brood stock. It is unusual for them to be in shallow waters close to shore. They favor the deep ocean. Officials know there is a population of giant lobsters out there on the bottom of the ocean. And they expect that soon Rocky will be back with the others. When Christmas lights and other decorations appear on houses and yards along the famous Maine lobster coast, another strictly Maine lobster tradition occurs. Lobster traps are stacked high on land in the shape of a Christmas tree and are decorated with Christmas lights and become the centerpiece of holiday festivals. Lobster is considered one of the most popular celebration foods in the country, and the Maine lobster dinner is especially popular during the holidays. A million pounds or more of live Maine lobster harvested by fisherman from these coastal towns are shipped all over the country between Thanksgiving and New Years. So it is only natural that towns that provide the fishermen that catch the popular holiday food should do something special with the tools of the trade. In one town, more than a thousand lobster traps were used to create a lobster trap Christmas tree. According to the Bangor Daily News (BDN), a 60 foot Lobster Trap Christmas Tree stands in Beals at the Moosabec Reach from Jonesport. The traps are decorated and topped with buoys arranged in the form of a cross. Another lobster trap Christmas tree stands in Rockland and is more than 30 feet tall and features an an illuminated lobster. According to BDN, the two Maine municipalities are like countless other places across the country that erect large Christmas trees in public gathering spots. Only instead of using actual trees, they use decorated lobster traps. The display in Rockland has been erected every year since 2003. This is the second year the people of Jonesport and Beals have decided to get into the act and build one. The Beals’ lobster trap tree consists of 1,364 traps, nearly twice as many as the number they used in 2010. It took roughly a week to build. According to the locals, serving lobster for celebrations or during the holidays is a tradition older than America itself. The lobster trap Christmas tree is just another way to celebrate the tradition. A television segment about the Lobster trap Christmas trees is scheduled to be aired on The Learning Channel at 9 p.m. Saturday, Dec. 10. What happens when a Cranberry Isle, Maine lobster boat retires after 45 years of lobster harvests and fish seasons and takes on a new life as a party boat right in the heart of Boston harbor’s vibrant new seaport district? The Belle slips by the Northern Ave. swing bridge in Boston Harbor one summer evening. Not so surprisingly, according to the cruise operators Charlie Gibbons and Diana Adame, the old lobster boat seems to have found the perfect new home. Refurbished with attention to detail and lovingly set up to accommodate guests, the 50-foot “Belle” sparkles under the bright city lights. Boston Fun Cruises currently embarks from the wharf behind the Barking Crab Restaurant. The vessel is tucked behind the old Northern Avenue swing bridge. Each cruise begins with the mighty bridge swinging its creaky, old iron rails open so the “Belle” can slip through. With long sweeping lines, wide working decks and a heavy wooden canopy that stretches from the helm nearly to the stern, the boat provides an intimate vantage for up to 40 passengers. The foredeck is deep and comfortable allowing guests to sit or stand and safely enjoy an open-air view. The “Belle” being refurbished at Rose Marine in Gloucester, Mass. On a recent Sunday evening trip, passengers enjoyed views of everything from the new hotels and restaurants by Liberty Wharf to the imposing, brightly lit downtown skyscrapers. A sunset canon salute was even observed while passing “Old Ironsides” in Charlestown; the USS Constitution is the oldest commissioned vessel in the US Navy. To some observers, the Belle is easily recognizable as a Beals Island design, the type of seaworthy fishing vessel that has plied the waters of downeast Maine since the 1950s. Gibbons said his boat was built in 1965 by boat builders Beal, Bunker and McCallister on Cranberry Isle. Both places are near one another and are famous for their lobster, lobster boats and lobster fishermen. Harvesting thousands of tons of lobster and fish over all its years, the vessel finished up its fishing career in Gloucester, Mass and was refurbished in 2011. Boston Fun Cruises is scheduled to operate in spring, summer and fall with a special New Years Eve 2011 harbor cruise scheduled so guests may observe Boston’s famous fireworks.